Service Rank and Number / Rheng gwasanaeth a rhif: Private No. 10451. 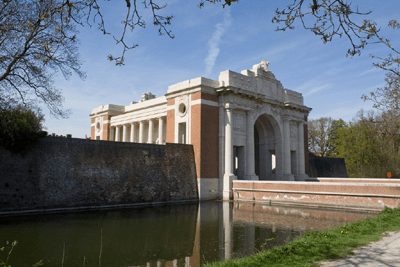 Military Cemetery/Memorial / Fynwent milwrol: Menin Gate Memorial, Ypres, West-Vlaanderen. Killed in action on Wednesday 21 October 1914, during the Battle of Langemarck, West Flanders aged 25 years. Edward Lloyd was born in Rhyl, Flintshire in 1889. The 1901 Census shows that the family lived at 10 Aquarium Street, Rhyl, Flintshire. The head of the family was Mary Lloyd aged 42, a widow. She had one son Edward Lloyd aged 12. Also living in the house was Mary Jones aged 19, a General Domestic Servant. Military Service: He served in India during 1912 and was in Malta from Tuesday 3 March 1914 to Tuesday 15 September 1914, when he sailed to France with the Battalion on Tuesday 6 October 1914 and was killed in action some 15 days later in Flanders, Belgium. There is a Flintshire Roll of Honour Card for Edward Lloyd at the County Archives, Hawarden, Flintshire, which was completed on 19 September 1919 and signed John Williams.